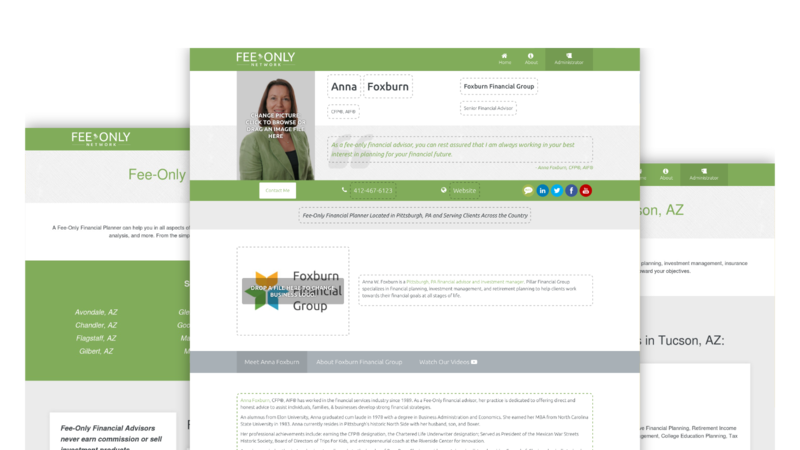 The first independent online tool for finding a Fee-Only Financial Planner. 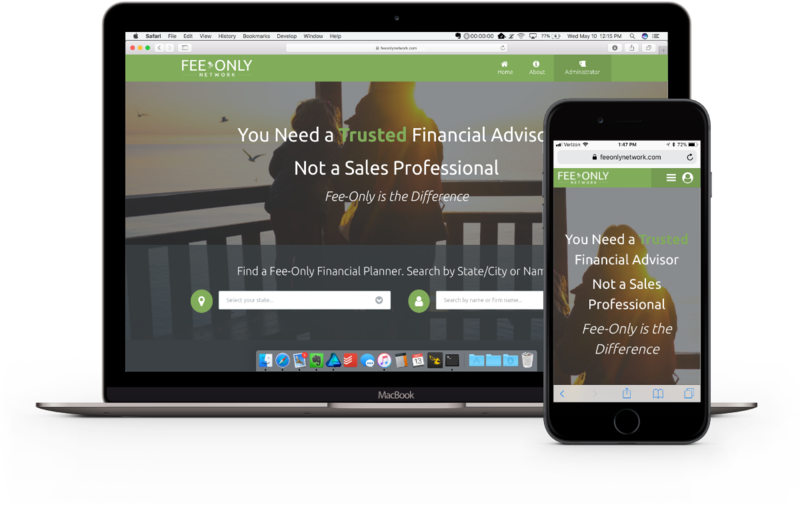 Fee-Only Network is a business with a big goal: helping to connect fee-only financial planners across the nation with prospective clients. 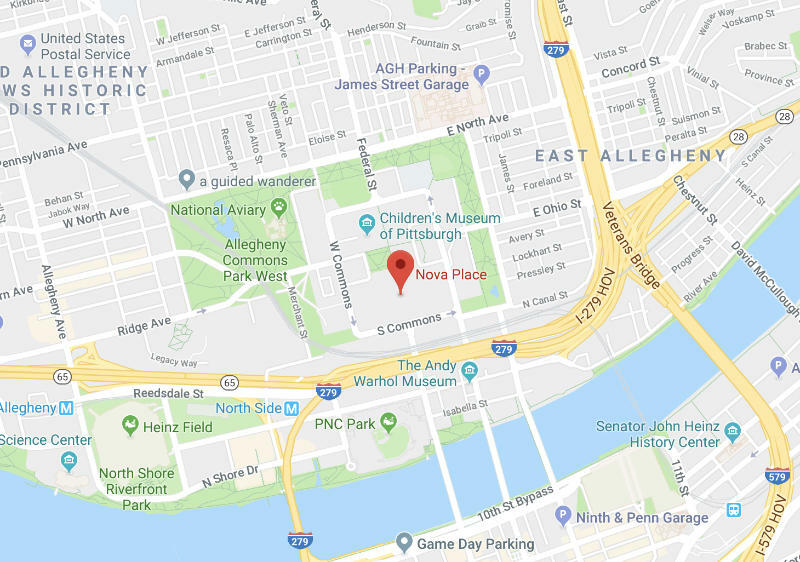 We created a completely custom WordPress web application that enabled this goal, all while keeping management easy for website users and administrators alike. Custom Web App Development, Featuring a Custom WordPress Theme. Fee-Only Network was a large development project with even bigger goals. We were charged with creating an easy to use, easy to update solution for marketing fee-only financial advisors to their potential clients across the US. The site that we made had to be built around a content management system, and required heavy programming and customization in order to expand the chosen platform into a perfect solution for the job. Update and modernize the Fee-Only Network website design, pulling inspiration from both pre-existing sites and original ideas. Build a custom, responsive website based around the design we created. 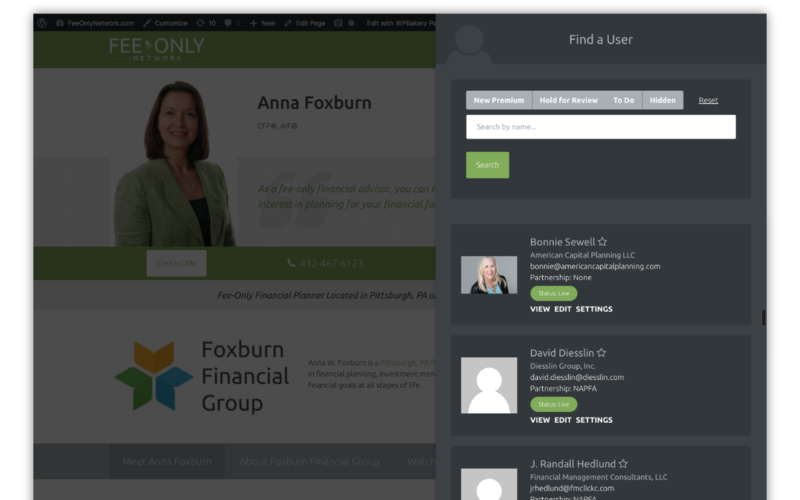 Create an easy to use profile editor so that financial advisors can edit their profiles on the website with little to no hassle. Integrate custom administrative functionality to make the site easy and quick to use for administrators. This was crucial since Fee-Only Network revolves around a high level of hands-on customer support from site administrators. Set up directory listings, sitemaps, profiles, and more to follow SEO best practice while simultaneously maintaining ease of use for the end user. In order to accomplish the goals set forth above, we decided to build a custom solution around WordPress. By starting with the WordPress platform, many aspects of the site build were provided to us, saving valuable time for the client. User management, site administrative functions, and more are provided out of the box by WordPress. We were then able to extend this platform using a custom plugin to add in additional functionality such as front end user registration, profile management, custom administrative functions, and more. We then topped the whole package off with a custom Thought Space theme built entirely around the design we created earlier in the process. The end solution was a website that’s as beautiful as it is functional. When we created the site, we wanted to make sure first and foremost that the end user experience was as clean and friendly as possible. This meant creating an entirely custom front end for the site, including an in-line profile editor that lets users update their profile simply by clicking on the part they want to change. Our custom plugin pulls AngularJS into WordPress in order to create this in-line editor. This also gave us access to many other modern web app utilities which ultimately helps give Fee-Only Network its modern, polished user experience. Special care was taken during the entire development process to ensure that using the site was as fast as possible for administrators. One of the main services offered by Fee-Only Network is their high level of customer support. Admins needed to be able to manage any profile with ease, and also update standard content on the site without hassle. By extending the WordPress platform, we provided admins with a standard, well documented interface for managing basic site content. With the use of our custom plugin, we then extended the WordPress core to allow administrators to manage user profiles with ease. The owner of Fee-Only Network has been very pleased with both the design of the site as well as the ease of use of the custom functionality, and has provided several testimonials to Thought Space Designs over the course of working together since 2015. Our work has made the task of maintaining and updating profiles much easier than standard content management systems allow. The integration of point and click (in-line) profile editing makes management a breeze. The best part is, as administrators use the site and find room for improvements to help their workflow, we’re available to step in and update the site. This process has allowed us to refine the site to a point that the client feels comfortable working within the site, which was very important to this entire project. By enabling our client to work quickly within the site, we helped them save more time for vital marketing efforts that have lead to large amounts of new sign ups every month since launch.